The Nalanda commitee translation, under the guidance of Chögyam Trungpa Rinpoche, and the translation made by the Dharmachakra commitee, under the guidance of Chökyi Nyima Rinpoche. In the previous version I had mixed the two translations, and later I realized it would be better to stick the exact words that the two different translation teams have chosen. The Trungpa version is has been around for many years now, and is well known by many practicioners. This recording is meant to be chanted along with repeatedly, so that its profound meaning will sink deeper and deeper in our hearts. Translated by the Nalanda Translation Committee under the direction of Vidyadhara the Venerable Chogyam Trungpa Rinpoche. © 1975, 1980 by the Nalanda Translation Committee. All rights reserved. The text is available on their website www.nalandatranslation.org> for personal use. 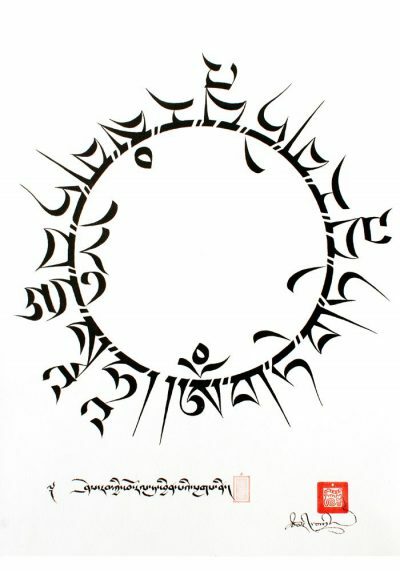 This is the Heart sutra in the translation of Dharmachakra commitee. Chökyi Nyima Rinpoche was teaching about this profound text at gomde Denmark in the summer of 2017, and for this occasion this recording was produced. saṇgha of monks and a great saṇgha of bodhisattvas. aggregates to be empty of nature. Form is emptiness. Emptiness is form. Emptiness is not other than form. way up to no domain of the mental consciousness. wisdom, no attainment, no non-attainment. what the Blessed One had said. This completes the Noble Essence of Perfect Wisdom. Translated by the Dharmachakra Translation Committee. I would like to share this recording, hoping it will also inspire others to chant it, study it, engage in it and connect to this profound wisdom that is meant to transform our minds and hearts for the better.